One of the most historic country houses in Suffolk, Ravenwood Hall can trace its roots back to the reign of King Henry VIII. It stands in seven acres of grounds a short drive from the A14 and is now a great favourite for social occasions and weddings (the Edwardian Pavilion is much in demand). Inside, the hall has been impressively restored, with much of its carved oak framework retained, along with rare fifteenth-century paintings and inglenook fireplaces. The stately beamed Tudor restaurant fully lives up to its name, and it provides an atmospheric backdrop for skilfully crafted food with a modern accent. Among the starters, you might see home-cured tuna and gravlax with summer pickles and rye bread or salt-and-pepper scallops on guacamole with roasted tomato dressing. Bouillabaisse is a speciality of the house, and the kitchen also sends out 'old favourites' like Long Melford sausages and mash alongside fillet of cod with Norfolk brown shrimp risotto and marsh samphire or roast rack of Suffolk lamb on a rösti with summer vegetables, morel and sherry sauce. To finish, try something traditional like Bakewell tart with damson jam, summer pudding or gooseberry trifle. The Ravenwood wine cellar list is loaded with fine vintages from France and beyond. 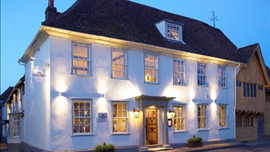 A little pocket of France in Suffolk is how Regis and Martine Crépy describe The Great House, their multi-award winning five guest room hotel and restaurant in Lavenham.